David Garfinkel is a highly sought-after copywriter with an uncanny knack for distilling complex, core copywriting concepts and strategies into practical steps that anyone, regardless of skill or experience, can easily follow, apply, and duplicate. How to make connections with other human beings (you might call them prospects). How to make a connection with people using the written word or the recorded word (video and audio), and all that that involves. How to make that connection involve action. You can connect with someone and have a feeling about it, but you’re never going to be able to help them or let them help you if someone hasn’t taken an action. It’s action that produces the live, real-time, in-person (or over the phone) conversation or personal email dialog. Copywriting is ALL the things you do that lead up to the real-time or in-person connection. Thanks once again for the free download and audio format! I can’t wait to dive into this one! Loving this interview! I don’t want to miss this month’s Leader’s Circle Call – they’re always so excellent – and this is great that I can listen to this as it fits into my schedule! Thanks, Ann and David. To join this inner circle, what will I do. Thanks. Thanks David and Ann. Awesome info! 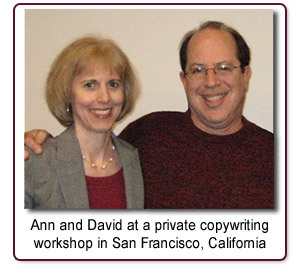 Thank you Ann and David , about Copy writing I learn some thing difference now, I am going to learn more at the work shop.